A range of classic dinner sets suitable for camping and caravanning. 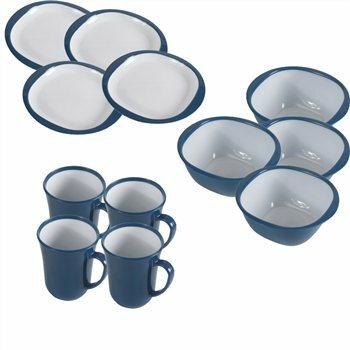 Available in blue they can be purchased as individual items or as a complete set.The kampa 12 piece dinner set in is ideal for camping, caravanning, picnics, in the garden or around the home because they are made of a durable plastic..Full size and light but strong. I bought this set from Camping world for family camping trips. I needed a hard wearing set with out frills. Initially I had problems with delivery (Royal Mail lost my first order!) Camping world where brilliant, they replaced the whole order with no problems at all. The member of staff on the phone was polite and concerned and I will definitely be using them again. I'm very pleased with this set which just arrived today. Ideal for camping or caravans etc. Delivery was very fast -even to IOW, and customer service is excellent. Good looking set and big enough to eat comfortably from. Be careful if using metal cutlery as plates tend to mark quite badly. Probably wouldn't happen if using plastic.